Welcome to the Parkinson Associated Risk Study website! The PARS study is groundbreaking study to test a strategy to evaluate individuals for early signs of Parkinson disease or other neurodegenerative disorders. The goal of the PARS study is to better understand who may be at risk for Parkinson disease so that it can ultimately be prevented before it starts. This study will evaluate thousands of individuals with or without a relative with Parkinson disease to determine whether specific tests are able to predict who may be at increased risk for developing Parkinson disease. The PARS study is also expanding to study general brain health in a study called MindSpan. The initial test to be evaluated in the PARS study is a smell identification test that is distributed by mail and completed at home. By using smell testing in combination with other tests we hope to develop a system to detect signs or symptoms that may predict who is at risk for Parkinson disease. 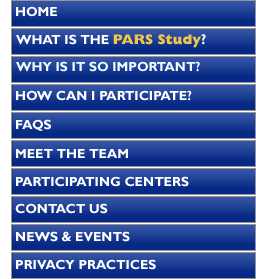 To learn more about why the sense of smell may be an important screening tool for Parkinson disease go to What is the PARS study? To learn more about how to participate in this study go to How can I participate?